If you looking for a quiet break with the best of country as well as being close to town this is the place. A cozy private self contained apartment with a great deck to relax on and enjoy amazing views. 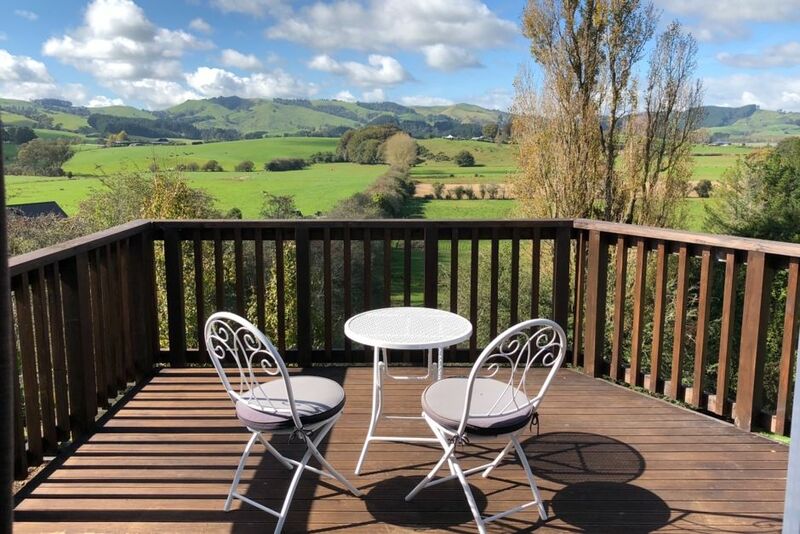 Only 2 hours from Auckland and very central to many tourist destinations including Hobbiton, Waitomo Caves as well as beaches.Ideal for professionals. Cambridge views is located 5 kms from the centre of Cambridge which has a large number of cafes and a local market every Saturday. Cambridge is easily accessible by car or bike. There are many bike tracks nearby as well as the Avantidrome. Lake Karapiro is located 10 minutes away which is very popular for rowing and summer water sports. Wifi and Sky are provided and there is a spa and pool available on the property. A simple breakfast is also provided. There is also a gas stove top in the kitchen and cooking facilities so that guests can do their own cooking. Please note the room has a queen bed and a portable single bed is available on request for extra guests. Only 5km from centre of town, but with rural views and privacy. Basic breakfast of toast and cereal is available. Beautiful, peaceful and serene. The animals were a treat. Very quiet and comfortable. Stunning views and very comfortable stay. The perfect location, especially for a Lord of the Rings nerd. Every morning I awoke and peered out onto the deck to be greeted by the Shire, with mist rolling over the fields and cows and sheep grazing below. Very close to Hobbiton Movie Set, and not far from Rotorua and Waitomo. All of the essentials are covered, even a fresh loaf of delicious bread. Great cats and dogs as well-- it was fantastic being greeted by them each time we returned. Stunning property and tranquil views-- I surely miss sipping wine out on the deck during sunset. Thanks for a great stay! This was a great place to stay I highly recommend it.we stayed 5 nights and it was perfect. Awesome people to deal with. We had a very enjoyable long weekend in this well set up cottage with amazing views of the surrounding countryside. The use of the spa pool was much appreciated too.